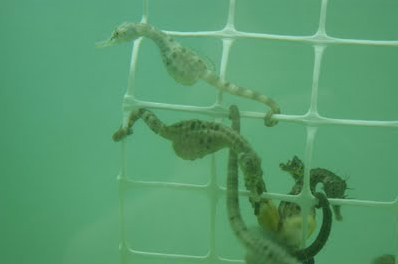 Today I visited a small aquarium called Seahorse World located in Beauty Point, Tasmania. They display over seven species of seahorses in addition to other local fish and invertebrates, and actively breed thousands of pot-bellied seahorses for research. I also got the chance to do a dive to see a deep water temperate reef that was very similar to the habitat that we display our sea dragons in at the aquarium. The invertebrate life was pretty spectacular. There were loads of sponges and ascidians in addition to hundreds of butterfly perch and southern hulafish. Both species of fish we currently display in our exhibit. It was difficult to get a good photo of the general habitat since it was relatively dark and the visibility was low, unfortunately. Tomorrow I head out for another dive.